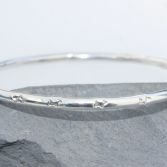 This lovely Simple Star Bangle has been made using traditional forging techniques and has been crafted from 3.25 mm round copper (also available in sterling silver) It has pretty little stars stamped around the edge. 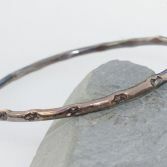 This bangle is handcrafted by me and can be made to any size, just email me if the size you require is not listed also allow 3-4 days from day of ordering if in copper and 7-14 days if sterling silver as hallmarking is required. Due to the handcrafted nature of this bangle very slight differences may occur in the pattern, however the images shown are a good representation of the bangle you will receive. 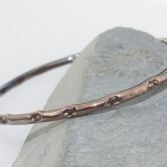 This bangle looks great worn alone but can be stacked with other bangles to create an individual look. Price is for one copper bangle. 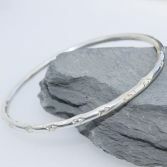 For a sterling silver bangle option use the drop down option below. 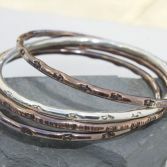 Copper has a beautiful warm quality and is renowned for its healing qualities, often worn to alleviate symptoms of arthritis.To keep you copper bangle looking nice i suggest polishing with a silver polishing cloth, it work great on both copper and sterling silver. 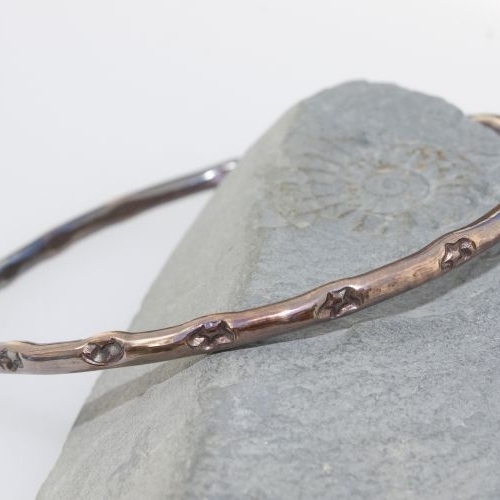 Your Simple Star Copper Bangle will be presented in a gift bag and bubble wrapped and placed in a bubble envelope and posted via Royal Mail special delivery (signed for) to any UK address free of charge.